Born in 1747. 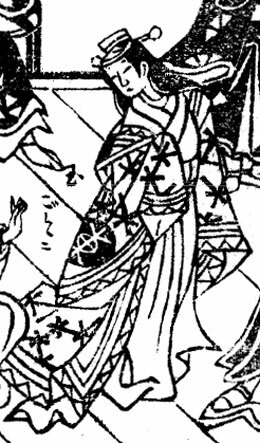 Disciple of Ichimura Uzaemon VIII, he started his career in the 11th lunar month of 1757, performing at the Ichimuraza under the name of Bandô Aizô as a koyaku in the kaomise program "Matsuhata Suma no Wakezato". He became wakashugata in the 11th lunar month of 1762, performing at the Ichimuraza in the kaomise drama "Kisoe Uta Sakae Komachi", which celebrated the shûmei of Ichimura Uzaemon IX and Ôtani Hiroji III. He became wakaonnagata in 1764. He took the name of Sanogawa Ichimatsu II in the 11th lunar month of 1767 at the Moritaza, becoming wakashugata and playing the role of Kajiwara Genta in the kaomise drama "Sanada no Yoichi Banjaku no Iezuto", which welcomed in Edo the Kamigata actor Yamashita Kyônosuke. 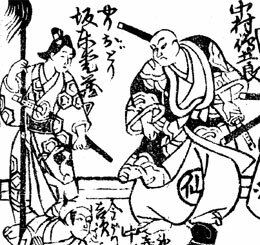 He became most likely a disciple of Matsumoto Kôshirô IV, specializing himself in iroaku roles and taking the name of Matsumoto Sanjûrô in the 11th lunar month of 1781, when he performed at the Ichimuraza in the kaomise drama "Mukashi Otoko Yuki no Hinagata", which also celebrated the shûmei of Ichiyama Sukejûrô. He took back the name of Bandô Aizô in the 11th lunar month of 1784, playing at the Kiriza the role of Katsura Sakingo in the kaomise drama "Jûni Hitoe Komachi Zakura". This was unfortunately his last stage appearance. 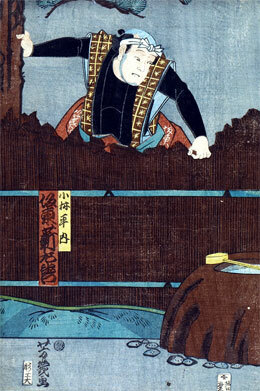 His last ranking in an Edo hyôbanki, tachiyaku section, was one white stroke above jô-jô [visual]. He died the 26th of the 8th lunar month of 1785. Born in Sendai the 6th of October 1896. He was the son of the show manager Takase Kichibê and his real name was Takase Daisuke. He started his career in ji shibai in 1903, performing in Shinpa. He settled in Tôkyô in 1917 and became a disciple of Bandô Shûchô III. He received the name of Bandô Chôemon in 1922. He joined the Zenshinza troupe in May 1931. He received the title of Meritorious Member of the Troupe in 1971, after 40 years of supporting roles performances for the Zenshinza troupe. His best role was Tonbê in "Yaguchi no Watashi". He died the 19th of February 1982. He was the grandfather of Nakamura Sennojô II. Born the 4th of January 1913. He started his career a disciple of Bandô Mitsugorô VII in April 1920 at the Ichimuraza, where he received the name of Bandô Mitsuya. He became nadai in July 1941, celebrating this event in Ôsaka at the Nakaza by performing in "Kumagai Jin'ya" and "Aoyama Harima". He took the name of Bandô Mitsusaburô in January 1947, in Ôsaka at the Ôsaka Kabukiza, where he performed in "Osaga Kaheiji", "Nageki no Tenshi" and "Kioi Jishi". These dramas were part of a special program, which celebrated the shûmei of Nakamura Ganjirô II and Kamimura Kichiya V, and commemorated the 12th anniversary (13th memorial service) of the passing away of Nakamura Ganjirô I. He appeared on stage for the last time in June 1986 at the Kabukiza, where he played the role of the farmer Kichisuke in the drama "Kumagai Jin'ya". He left the Kabuki world in 1988. No record afterwards (unknown day of death). He was a supporting tachiyaku actor who served for more than 66 years four generations of masters of the Bandô clan, from Bandô Mitsugorô VII to Bandô Yasosuke V.
Date of birth unknown. He started his career around 1737 as an iroko at the Nakamuraza, performing under the name of Yamatogawa Utagiku. He became a disciple of Sawamura Kodenji II and received the name of Sawamura Utagiku. He became wakaonnagata at the beginning of the 1740s and took the name of Sawamura Kodenji III in the 11th lunar month of 1756, performing at the Moritaza in the kaomise drama "Manazuru Heike Monogatari". He became kashagata and took the name of Bandô Sadajûrô in the 11th lunar month of 1764. He held it up to his death the 10th of the 6th lunar month of 1771. Year of birth unknown. He was most likely a disciple of Bandô Hikosaburô IV. His first stage name was Bandô Sasahei. He took the name of Bandô Shinzaemon in 1858 and held it up to his death in 1875. He played the roles of Kamaya Buhê in the drama "Kichisama Mairu Yukari no Otozure", which was premiered in the 7th lunar month of 1869  at the Nakamuraza [casting]. Born in 1833. He started his career in Nagoya in the middle of the Tenpô era as a disciple of Arashi Mitsugorô II, who gave him the name of Arashi Mitsuzô. He spent his prime peforming in miyaji shibai in Kamigata. He became a disciple of Nakamura Shikan III at the beginning of the Ansei era and changed his name to Nakamura Umezô. He settled in Edo and took the name of Nakamura Tsurusuke IV in the 1st lunar month of 1862 in Edo at the Moritaza, where he performed in the drama "Kurikaeshi Mimasu no Tamamono". He became a disciple of Ichikawa Kodanji IV at the beginning of 1864 and received the name of Ichikawa Kobunji I in the 2nd lunar month of 1864, performing at the Moritaza in the drama "Kinoene Soga Daikoku Bashira". He finally joined the Morita clan, becoming a disciple of Morita Kan'ya XII and taking the name of Bandô Tarô in the 8th lunar month of 1866. He appeared on an ôshibai stage for the last time in May 1874, in Tôkyô at the Sawamuraza, where he played the role of Sôgo in the drama "Iro Moyô Sakura no Shiranui". He spent his latter years in koshibai or tabi shibai. He died the 26th of April 1894. This actor was able to perform a wide range of roles from onnagata to katakiyaku. He excelled in villain roles like Murai Chôan (in the eponymous drama) or Ishikawa Goemon. Born the 25th of March 1909. He started his career as a disciple of Nakamura Fukusuke IV in 1920 in Ôsaka. He became a disciple of Bandô Hikosaburô VI in December 1924 and received the name of Bandô Yaenosuke. He became during the Shôwa era the most important tateshi in Kabuki. He was in charge of crafting spectacular tachimawari, especially for the Onoe Kikugorô Gekidan troupe. The best examples were the tachimawari in "Ranpei Monogurui", "Kokingo Uchijini", "Suzu-ga-Mori" (the fight in the dark between Shirai Gonpachi and the group of kumosuke) and "Shiranami Gonin Otoko" (the fight on the roof of the Gokurakuji Temple). His art of tateshi was designated as an Important Intangible National Treasure in 1964. He trained Kabuki students at the National Theatre training center and trained several tateshi. He died the 7th of January 1987.